This is a Pearson VUE exam voucher code for Blockchain Exam BC90.01. This voucher code can be redeemed online when scheduling the exam for delivery at a Pearson VUE testing center or via Pearson VUE Online Proctoring. This exam voucher code can only be used once and will be set to expire one year as of the date of purchase. After purchasing this exam voucher the voucher code will be emailed to you separately within the current or next business day, depending on your time zone. To redeem the voucher code and for more information about Pearson VUE testing center locations, scheduling and online proctoring, visit www.pearsonvue.com/arcitura. Please note that for any Arcitura exam, a 30 minute ESL time extension can be purchased. This time extension must be purchased separately after the exam voucher code has been obtained, by contacting Pearson VUE by phone. For international Pearson VUE contact numbers, visit www.pearsonvue.com/arcitura/contact. This exam voucher code can only be used once. If you wish to retake an exam, you will need to purchase another exam voucher. To learn more how to retake exams, visit the Arcitura Exam Retake Policy page. 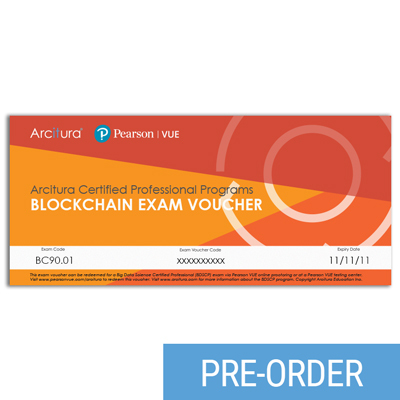 If you are interested in purchasing 10 or more exam vouchers at the same time, then contact info@arcitura.com to request the Arcitura Exam Bulk Order Discount Sheet or to request a quote. High-volume bulk order discounts are also available.